December 19, 1908 -- This cartoon accompanied a short satirical text piece by Herriman in which he observes that marathoning is catching on to such a degree that women, the elderly, and children will soon be doing it. What I wonder is what's up with this old gent's mouthal area. Looks like his beard is sewed onto his face. One of F.M. Howarth's longest-running series, Mr. E.Z. Mark, makes an appearance on a card that was a complimentary gift from a Hearst newspaper. There's quite a few cards of this type, and I don't know if they were given away in Sunday editions, or with a subscription, or what. This one is marked "Compliments of New York Sunday American & Journal" on the reverse. 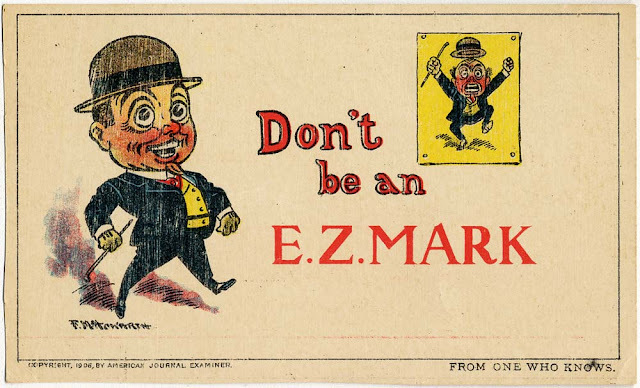 As you can see on the front, this card was issued in 1906. Actually in reference to the earlier "Wish You Were Here" about the chorus girl. Irving Berlin wrote a song in 1911 titled "How Do You Do It, Mabel, on Twenty Dollars a Week?" It's about a rube asks his girlfriend -- who moved to the city and became a chorus girl -- how she manages a flat, a motorcar, jewelry and the rest on her paycheck. The joke of the song is that he's honestly amazed and curious , not suspicious. Max Morath, a ragtime pianist / vocalist / historian, included the song on one of his albums. The postcard predates the song, and it seems to offer a choice of interpretations: The flamboyant chorus girl's $8.50/week is supplemented by a stage door Johnnie (note she appears to be pulling a banknote from the bouquet); or the high-rolling Johnnie is the one who's living beyond that paycheck (in his dreams? The question is "How CAN you do it? ). The ambiguity may be intentional to dodge complaints. Bon vivants and girls from the stage seem to go way back as a subject for racy humor; perhaps because theatricals were somehow neither actual prostitutes nor local good girls being corrupted. Fantasy figures, if you will. Dale Hale spent most of his cartooning and writing career working behind the scenes. He did a stint as Charles Schulz's assistant (helping with everything except the Peanuts strip itself of course), he ghosted the Yogi Bear and Flintstones comic strips for long stretches, and worked extensively in television animation. One of the few times he got a byline of his own was with a newspaper strip he created titled Figments. The idea was simple, funny and an infinite source of gags --we take a look into a character's mind to see what they are thinking. While Hale particularly enjoyed examining a kid's skewed perspective about some aspect of the adult world, everyone was fair game. Although the strip was not really cast-driven, there was actually a family being portrayed -- mom. dad, three kids, and a dog. The strip seemed like a winner, and I don't imagine Hale had much trouble finding a syndicate to take it on. It was Iowa's Register & Tribune Syndicate that got Hale to sign on the dotted line, and the strip premiered on May 3 1971. Oddly though, not a lot of papers picked up the new offering. Hale stuck with R & T until January 1974, and then switched to the Los Angeles Times Syndicate. At this time the strip's client list seemed to grow a bit, but it still wasn't exactly becoming a blockbuster. I don't know who dumped who, but sometime in 1976 Figments came to an end. Or did it? 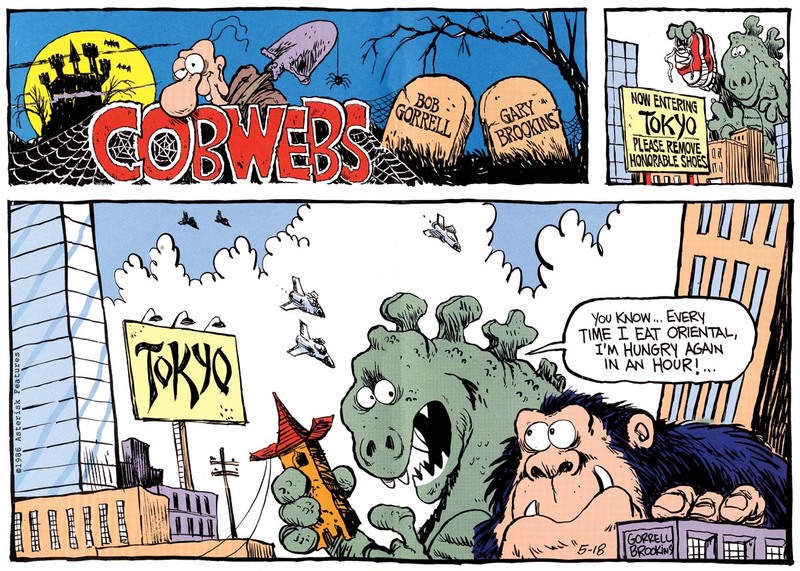 Although I consider that to be the end of the strip, Dale Hale has been quoted saying that Figments ran until 1988. Examining that claim, we find that the Editor & Publisher syndicate yearbooks have the strip advertised as available from Manson Western Features in 1976-78, Dickson-Bennett Features 1981-84, Whitegate Features Syndicate 1985-86, and American International Syndicate from 1987-1994. Problem is that these are all syndicates which offered lots of features, none of which I've ever found in any mainstream newspapers. I hesitate to use the term fly-by-night, but let's just say that they all seemed to be spectacularly unsuccessful at placing their features. Or maybe their specialties lay elsewhere -- perhaps they sold to newsletters, company publications, foreign publications, like gangbusters? I find it hard to believe that Dale Hale would have wasted his time producing the strip for these syndicates. My guess is that he offered his five years worth of dailies through these folks as reprints. If they sold them, great, if not, no harm. I've tried to contact Dale Hale to clear this up, but unfortunately have not gotten a response. If you'd like to see more of Dale Hale's Figments strips, check out his website. This was a great strip - as a kid - I cut Figments out of the paper every day and still have this great collection! I vividly remember Figments being replaced in NY ( afternoon at the time paper, Newsday) in the early 90's. I am sure of this because I had atatted a new nob and remember discussing it being replaced by the awful 'One Big Happy' which a new coworker and I thought was a huge piece of garbage.def between 1990 and 93. I am 100% sure because I think of this every tome I see 'One BIg Happy' whixh still runs in that paper. Could Figments have lingered as reprints? Austin Clyburn Williams was born in Westville, Indiana, on May 12, 1888, according to his World War I and II draft cards. His full name was found at Find a Grave, although the middle name spelling was different on the World War II draft card, “Clybourne”. An Ancestry.com family tree said Williams’ parents were Charles Madison Williams and Virginia Adelaide Clyburn. Williams was counted twice in the 1900 U.S. Federal Census. An enumeration on June 2 recorded Williams and his “widower” father, a salesman, as boarders in the Wibber household in Hanover, Indiana. A later enumeration on June 25 said Williams and his “divorced” father resided with his father’s parents in New Durham, Indiana. Williams has not yet been found in the 1910 census. “Father ran a drugstore at Westville, Ind., and intended to have me follow in his footsteps. In fact, he determined I should start following right away, when I got fired from school for drawing pictures of the teacher. “But a littler later, I convinced him that the place for me was the Chicago Academy of Fine Arts, and I attend that school for three years. “When I got out, I was strong for newspaper work but Fate again stepped in. I had such a facility for lettering and there commercial work that before I knew it i was buried under orders for stuff of that nature. The longer I sang the praises of Smothery Soap and Timpkins’ Toothpicks the deeper i got, and the farther away from newspaper work. The 1913 Chicago city directory’s artist listings said Williams was at 58 West Washington. On October 1, 1913, Williams married Mary Mary Mcilhargey in Detroit, Michigan, according to the Michigan marriage record at Ancestry.com, which said Williams was a sign writer. American Newspaper Comics (2012) said Williams produced Red and Skeeter for the Chicago Daily News. The strip ran from March 20 to June 19, 1915. The June 5 strip was by Pierre J. Kinder. Some time in 1917 Williams continued Ted Brown’s strip The Inventor which ended June 30, 1917. Williams was one of several artists whose name appeared in a Chicago Academy of Fine Arts advertisement in Cartoons Magazine, April 1917. Williams signed his World War I draft card on June 1, 1917. He, his wife and child resided in Chicago at 6643 Drexel Avenue. 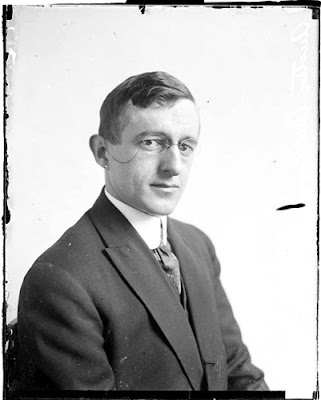 The Chicago Daily News cartoonist was described as short and slender with dark brown eyes and hair. An Ancestry.com family record said Williams married Alberdina Weert on October 12, 1922. Another family tree had the first name as Alberta. The 1930 census recorded newspaper artist Williams and family at 14108 Mark Twain Avenue in Detroit. Williams was a commercial artist in the animation department of a picture company according to the 1940 census. He and second wife “Bertha” had two children, Betty Jane and Jack. The family of five, which included son Richard, lived in Detroit at 14428 Lauder Avenue. Williams’ address was the same on his World War II draft card which was signed on April 27, 1942. Williams was employed by the Montgomery Ward Company. The family tree said Bertha passed away in 1964. Williams passed away May 6, 1976, in Pontiac, Michigan, according to the Michigan death index. He was laid to rest at Mount Olivet Cemetery. Last Thursday you saw the Chicago Tribune's 1951 profile of William "Tim" Timym, whose comic strip they syndicated. Now here's his strip, Caesar. As tumultuous as Timym's early life was, it is perhaps not surprising that his comic strip Caesar was quiet, simple and gentle. After surviving concentration camps, Tim must have been delighted to sit at his drawing board and come up with simple gags about a dog. My knowledge of Caesar's origin outside the US is spotty. I understand that the strip debuted in London's Sunday Graphic around 1945. In 1950, the Chicago Tribune-New York News Syndicate got interested in the strip, and it debuted here as a daily on June 12. Although syndication to U.S. newspapers certainly didn't take off, my guess is that the syndication was doing well in international markets, because they soon added a Sunday strip, on February 4 1951. As a pretty strict pantomime strip (in addition to no speech balloons, even written signs were rarely used), it was excellent fodder for international syndication because practically no translations were necessary. My guess about international syndication may be all wrong though. It is quite possible that the international distribution was retained by the Graphic. In that case, I'm not sure why the Trib-News Syndicate stuck by this strip. According to the E&P yearbooks, both daily and Sunday were offered until 1964, yet I've not seen a single example of the Sunday later than 1957, and the daily is a rarity at any time during the run. Outside the U.S. I've not been able to find an end date for the strip other than vague mentions of 'the 1960s'. Anyone have more info? Might we justifiably proclaim that "Caesar" is a name analogous to "Napolean," and that Timym's canine resembles Uncle Ellby's? In the 1980s, when editorial cartoonists all seem to have gotten the same idea at the same time to branch out into comic strips, Bob Gorrell and Gary Brookins took their turn up at the plate. As editorial cartoonists for, respectively, the Richmond News-Leader and Richmond Times-Dispatch, this would seem like an unlikely alliance. However, the two Richmond papers were not actually rivals -- they were under the same ownership. Both creators were fans of horror and monster movies, so they came up with a strip idea that they hoped would be the comic strip equivalent of the movie Young Frankenstein. Cobwebs brought together a team of classic horror movie characters -- Dracula, the Wolf-Man, the Mummy, Frankenstein, a mad scientist and a hunch-backed henchman -- into a comic strip that spoofed the genres. Gorrell supplied layouts and pencilled art, Brookins inked, and both creators supplied gags. After being turned down by the major syndicates, Cobwebs found a home at Asterisk Features, a small but high-quality start-up helmed by John Somerville. Somerville was surely attracted to the excellent art, and hoped that the appeal to horror-movie fans (a genre going through a major revitalization in the 80s) might get newspaper feature editors to take a chance. Sadly, his expectations didn't pan out, and when Cobwebs debuted on May 12 1986 (Sunday starting May 18), it was in a very small list of newspapers. Gorrell and Brookins gamely stuck with the strip through a one-year contract, but by the end of that term it had become apparent that no Peanuts-like slow build was in the offing. The strip was given last rites on May 30 1987. I remember this strip from an article in CARTOONIST PROFILES, and I think it ran in the BOSTON GLOBE very briefly. It always seemed to me that Brookins' take on the dimwitted Frankenstein was a loose caricature of Ronald Reagan.